The Araldite 502 kit with BDMA accelerator is equally efficient as the same kit using DMP-30. BDMA has a lower viscosity and diffuses more rapidly into tissues, porous specimens and rough surfaces. The Araldite 502 resins have better beam stability than the Eponate resins. BDMA is used in 3% concentrations versus 1.5 to 2% for DMP-30. 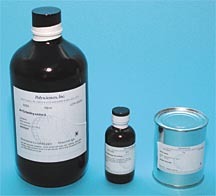 Araldite kit may be used alone or mixed with other epoxies. Curing times are 16 to 24 hours at a temperature of 60°C or 2 to 3 hours using the PELCO BioWave®. 1 Glauert AM, Glauert RH: Araldite as an embedding medium for electron microscopy. J Biophys Biochem Cytology, 4:191-194, 1958. 2 Glauert AM: Fixation, dehydration, and embedding of biological specimens. Practical Methods in Elec Micr, 3(1). Glauert AM, ed., North-Holland, Amsterdam, 5th reprint 1975. Aliphatic epoxy resin based on di- and tri-glydicyl ethers of glycerol with a significantly lower viscosity compared to Araldite 502. BDMA (<3%, see notes preceding) is used as the accelerator since it has lower viscosity and diffuses into tissues more rapidly. (See references below). 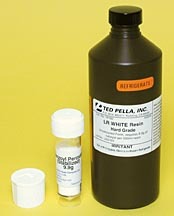 The viscosity of Eponate 12 at 25ºC is 15-21cP, WPE is 140145 and Specific Gravity is 1.151.22g/ml. Other kit viscosities at 25ºC include DDSA (290cP) and NMA (225-315cP). Eponate 12 is hygroscopic. Curing time is 16 to 24 hours at a temperature of 60°C or 2 to 3 hours using the PELCO BioWave®. Finck H, 1960. Epoxy resins in electron microscopy. J Biophys Biochem Cytol, 7, p. 27. Luft JH, 1961. Improvements in epoxy resin embedding methods. J Biophys Biochem Cytol, 9, p. 409. NMA Hardener in increased amounts, in the embedding mixture, make a harder block. ERL 4221 has replaced ERL 4206. ERL 4221 has a higher viscosity than the previously used ERL 4206. Spurr AR, 1969. A low-viscosity epoxy resin embedding medium for electron microscopy. J Ultrastruc Res, 26, p. 31. The Spurr Kit gives excellent penetration for tough materials particularly in the studies of botanical, mineral and other hard biological specimens. When the mixture is kept at room temperature for 24 hours its viscosity will increase to 140cP, as is the case with other resins. When fully formulated, the Spurr’s resin will store in a deep-freeze for two months and at room temperature for two days. Curing is done at 70ºC for about 8 hours (see our Microwave system for significant time saving during epoxy processing). Poly/Bed® 812 for electron microscopy and histology for studies requiring beam stability, low shrinkage and good contrast. Epoxy formulations are lower in viscosity than Araldite formulations, and hence provide better penetration into tissue samples. Contains BDMA in place of DMP-30 for faster infiltration. Instructions, Supplies, Syringes provided for leftovers. Mixture bottle provided. 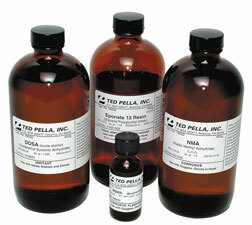 Includes 92ml total consisting of ERL, DER® 736, NSA, DMAE and supplies for embedding.